Catering for the future of our sport, we created a skate that is size adjustable, which is just what youngsters with growing feet need. We know that skaters who want to learn to skate aggressively need to be taken seriously, and unlike many other brands or superstore skates, we provide the perfect setup to allow the skater to achieve any of the tricks veterans of the sport can do on their full sized skates. 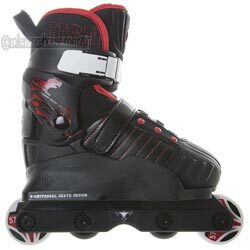 The skates come with soulplates with a royale groove, grooved Kizer midget frames and USD wheels. – This ain’t no toy! UFS Frame, USD wheels 55mm/90A with ABEC 5 bearings, UNDERCOVER Grindrocks and little shockpad under the liner. Frame and Soulplates are reinforced with fiberglass for faster grinds on ledges and rails. 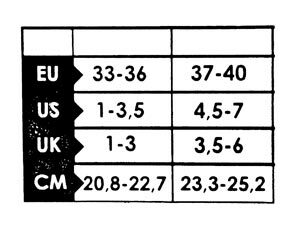 Sizing Chart below is specific to USD Transformer's.